Justice Antonin Scalia’s death on February 13, 2016 put a heightened sense of urgency on the presidential elections. The unexpected Supreme Court vacancy in President Obama’s last term added fuel to an already contentious election cycle. And the loss of the most conservative judge on the court left a vacancy that could tip the scales of justice for decades to come. Through all the public speculation, President Obama kept a tight lid on who he was considering. His only public comment was in the form of a post on the SCOTUS Blog, where he summarized what he would be looking for in potential nominees. Published two weeks after Scalia’s death, Obama noted that he was seeking a nominee with a sterling record, a deep respect for the judiciary’s role and an understanding of how the world really works. What Obama didn’t share was that his choice would be a perfect fit for the current political climate. Merrick Garland is the chief judge of the U.S. Court of Appeals for the D.C. Circuit. He was nominated by President Bill Clinton and has served on the court for 19 years. His impressive résumé clearly meets the President’s first criteria. Garland shares much in common with the current SCOTUS justices, including a degree from Harvard Law School. His tenure on the D.C. Circuit court of appeals represents a similar career path of the late Justice Scalia, as well as three of the current SCOTUS justices. Chief Justice John Roberts even served on the D.C. court with Garland. The political brilliance of Garland’s nomination cannot be understated. It was only a few hours after Scalia’s death when Republicans drew their line in the sand. Seeing their conservative hold on the court disappearing, they immediately announced that they would refuse to hold hearings on any nominee. 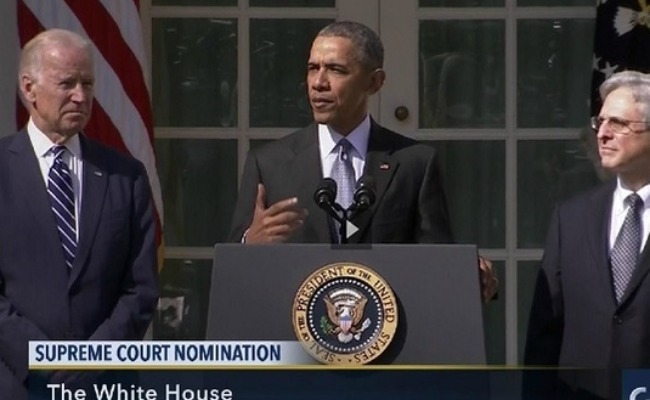 Garland’s nomination only highlights Republican intransigence. Seven senators currently serving were among the 32 Republicans who voted to confirm Garland nearly 20 years ago. Those same Senators are part of the chorus that insist they will not confirm any nominee until the next president is sworn into office. However, at least one of them, Senator Orrin Hatch (R-UT), specifically put Garland’s name forward to President Obama when he was filling the vacancy that Justice Elena Kagan eventually claimed. Kagan also worked with Garland when they were both at the Department of Justice. There is little in Garland’s work that shows any political bias, which satisfies the President’s second criteria – a deep respect of the judiciary’s role. Those who have worked with Garland noted that he is thorough in his analysis, reviewing the law in context of the times. In other words, Garland understands his job is to interpret law — not to make new ones. This is a major talking point of Republican judicial criteria, making any opposition claims of “judicial activism” appear hollow. Ironically, it is the hostile environment created by Republicans that led to the nomination of Merrick Garland. He embodies every qualification they have claimed to want. While Garland may seem less ideal for progressives, his ability to meet the President’s third criteria should put them at ease. Supreme Court decisions have a long history of affecting the daily lives of Americans. Merrick Garland’s own words during his speech on Wednesday show that he not only understands that, but he also considers it a factor in his decision process. Garland spoke of his time as a prosecutor — particularly in one case that required himto prosecute gang members who had taken over an apartment building, terrorizing residents. He had to convince mothers and grandmothers who feared for their lives to testify. Garland felt a great responsibility in proving to them that justice would prevail. Now — perhaps understanding that their obstruction cannot be hidden — four Republicans have said that they are willing to meet with Garland. That’s more than anyone was willing to do prior to the nomination. It should also be noted that at 63, Garland is significantly older than most SCOTUS nominees. His tenure will inevitably be much shorter than the average nominee in his or her early 50s. Clearly, the President is not focusing on his legacy but instead choosing to prioritize the needs of the country. Both sides do it. When Bush was in office the dems tried to block his nominee and he still had 18 months left in his term. This time the election is already in full swing. This seat should remain unfilled and let the next president fill it. Matt B. writes of Merrick Garland, " ...a fellow Leftist onto the USSC bench who won't properly follow and honor the Constitution. ... "
Matt, what in Garland's record leads you to this assertion? You really can't help it, can you? You have an obsessive-compulsive behavioral disorder, manifested in your need to be incessantly and mindlessly equivocating. The FACT is, past [D] senate leaderships never threatened to hold back a vote for a [R] presidential SC nominee once there was an actual SC opening. The FACT is past [D] senate leaderships never refused to meet with an ACTUAL [R] presidential SC nominee to short-circuit the nomination process. Those two things are actually happening RIGHT NOW, by the [R] senate, to a [D] presidential SC nominee! So, NO, you are DEAD wrong. The [R] congressional leadership is not merely threatening to follow the misnomered and mis-applied "Biden rule", THEY ARE ACTIVELY APPLYING THEIR OWN VERSION OF IT RIGHT NOW BY THEIR OWN ACTIONS. You show yourself once again to a pathetically happy apologist for rightwing malignancy. Some people seem to be confused on the so-called "Biden rule." Joe Biden made his speech stated that should the situation arise, the Senate should postpone action until after the campaign has ended. The intent was not to postpone action in the hopes that the Democrats win the WH. Rather, he was hoping to avoid having the confirmation process become an election issue. Thus far, the Republicans have only threatened to follow the Biden Rule. We will see if they actually go so far as to carry it out. Aria Spenser. RECORD number of Republicans went Independant or Democrat since Obama took office. Not one left in the bunch at Wounded War veteran office in Brooklyn. Someone in Manhattan threw Ann Coulter out of office and told her to shove check up her arse.Thanks Obama!! Matt B. Try getting a kid to read the Constitution. He will read it to you SLOWLY. Oh, c'mon, Regus! Show a little mercy! They chose to be this way. Voluntarily selected idiocy is a way of life for many. Bruce K.Again with blatant lies. You need to stop looking at Faux News. I did. Lost five years of my life. I actualky did some investigating on their lies. Too many to count. You should try getting the facts. A five year old can do it.